What do you do when it's been raining for a few days and you can't get out and take your outfit shots? Take them in your lounge of course! 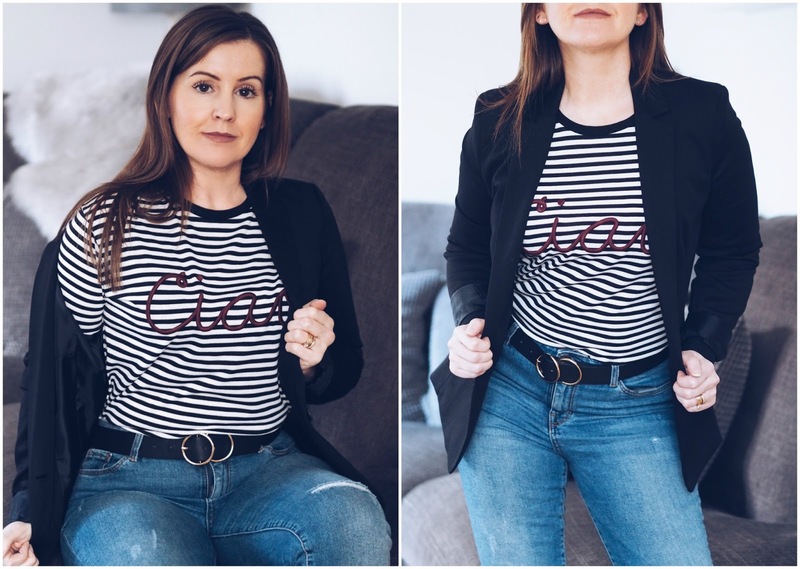 I popped a snap of this top on my Instagram a week or so ago and it got so much love I thought I'd bring it to the blog, albeit indoors, but I think it works! It's not just this utterly fabulous top I want to talk about though, it's blazers too. I'm desperate for it to warm up a little, know that may be a long way off yet, but I literally can't wait to throw off the layers and start wearing a lighter jacket again. So, that's my love for a good old blazer, now the striped top! It's so comfy to wear and I love that it has long sleeves. Did I tell you I'm ALWAYS cold? Nick swears I have something wrong with me. Urrrr.....not sure if he means something wrong with me in general, he probably does, or that there's something medically wrong with my hands and feet cos they're constantly like blocks of ice! You know what they say though, cold hands, warm heart. That's me! I know you're only here for the top. You can never go wrong with stripy monochrome, throw in an embroidered purple 'Ciao' slogan and it's a winner. Oh yeah, nearly forgot to say it's only £19. Even more perfect. So, the moral of that fairytale folks is go in to store or order a couple of sizes if ordering on line! The belt is the beauty from River Island that we all pretend is our Gucci. I'm sure you've seen everyone wearing it? It's a great belt though, as far as belts go!!!! [One day Gucci belt of dreams, you will be mine, you thing of beauty you!] The real deal is here if you want to splash the cash. You can shop the look below and if you do anything as we move closer to spring, make sure you own a blazer and monochrome slogan top! 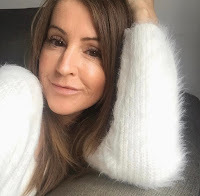 Linking up with Honest Mum, Style Splash and Nancy's fashion style, Not Dressed s Lamb. What's not to love! I love both blazers and breton stripes,and your pairing looks fabulous Stephanie. I'm very tempted to look at the RI belt. Thanks for introducing that to me. I feel your pain re not being able to get out too. I'm having a horror of a time and every room in my tiny London flat just doesn't work for a shoot. Love love love these pics and obviously more so the outfit! You look AMAZING! I love the smart casual look, however it's not been a look I've really done myself.. But I am DEFINTELY adding blazer to my post-pregnancy wishlist! A blazer to me it's the best example of 'smart casual' if ever there was one. Always useful to have one to hand! Spot on with the 'smart casual' Mel, I'm getting a good collection of blazers now, but they just go with everything don't they! Breton stripes, a blazer and jeans is one of my favourite outfits. It's a combination I wear frequently when the weather allows. I keep looking at my lovely jackets hanging in the wardrobe, all neglected, just waiting for the warmer weather. Thanks for linking up! I love this outfit! The stripes are a nice contrast with the burgundy writing and pairing it with the navy blazer is genius. Love, love, love your look!